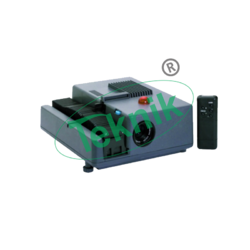 MIcroteknik offers Best Quality of Audio/visual Equipment. Our Audio Visual Equipment Quiality is Best. 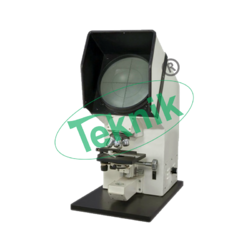 We manufactuer ofAutomatic Slide Projector,Advance Projection Microscope, Film Strip-slide Projector, Portable Over Head Projectors, Projections Epidiascope, Projection Microscope, Projection Slide Storage Box, Projection Slide Storage Cabinets. 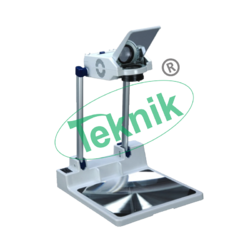 Packaging Details: As the "teknik" projection systems are the most delicate product hence utmost care is taken while in packing,these instruments are packed in bubble sheet and then in foam, again it is packed in sturdy virgin card board box and then in wooden case. cleaning cloth, venyl cover. Packed in a card board box with thermocol packing. Single low voltage bulb 24V-250W, Halogen through step-down transformer. Double low voltage system with 2 Halogen bulbs, 24V–250W through step-down transformer. The dual bulb system facilitates switching over to second provided bulb instantly in case of damage of the running one without disturbing continuity of discussion. Writing surface of 285 x 285 mm instead 250 x 250 mm. Rest same as J-12CL Single low voltage bulb 24V-250W, Halogen through step-down transformer. JW-2 : For storage of 2x2" projection slides. 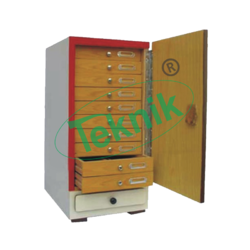 Cabinet made of duro-board clad in laminated sheet. Sliding drawers with wooden grooves carry slides vertically. An extra drawer is provided to keep index card sheets. Dust proof door has locking arrangement. 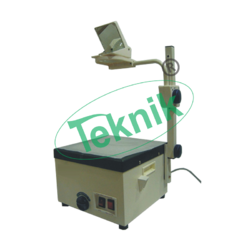 Portable Overhead Projectors (OHP-Portable):(Single low voltage bulb) Folding type, smooth focusing with 3-element high definition varifocusing lens supported by picture sharpness compensator to achieve brilliant projection with optimum resolution & contrast. Equipped with 24V-250W halogen bulb, mini turbo cooling fan, thermal cut-out for safety. Writing surface 285 x 285 mm. Supplied in moulded luggage case. OHP (Portable) :(Dual low voltage bulb) J-12 CP (ii) : Two low voltage 24V-250W halogen bulbs with lever to instantly shift to second provided lamp in case of sudden failure of the running one. J-12 A2 : Screen with Stand : Metallic, folding, sturdy, portable with collapsible tripod stand. 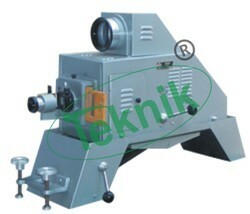 Housing equipped with automatic spring roller system. Screen Size : (i) 120 x 130 cms. (ii) 132 x 178 cms. J-12 A5 : LCD Panel. 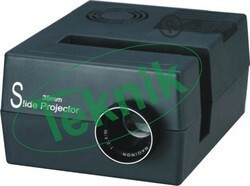 Film Strip-Slide Projector is the latest, improved & versatile projector model. It is provided with efficient cooling system and heat resistant glass protection. Suitable to project 35mm film strips. 2" x 2" projection slides and 3" x 1" prepared microslides. Epidiascope is a convertible projection equipment with 'A' grade anastigmatic lenses and surface-coated reflecting mirrors for brilliant projections of opaque objects as well as projection slides, film strips etc. Complete with attachments for projection of 3¼ x 3¼" and 2 x 2" projection slides, 35mm film strips and prepared micro-slides. 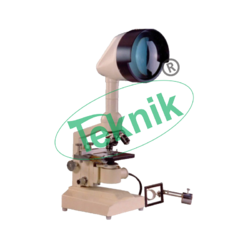 2.5 lenses equipped with Halogen lamp. Operated through remote control for forward, reverse and fine focusing. 36 slides linear magazine with imported mechanical & optical components to achieve brilliant and sharp projections. Looking for Audio Visual Equipments ?